Well, we've been listening, and today I'm proud to announce the launch Google Analytics Demos & Tools, a new website geared toward helping Google Analytics developers tackle the challenges they face most often. For instance: If users coming from source X tend to use your app once and abandon it, while users from source Y tend to use it for eight months and generate $68 each in value, you'll know. And with Google Analytics' powerful segmentation, you can combine post-download metrics with your acquisition channels across all Google Analytics reports, to make even better decisions for your marketing programs. New iOS install tracking report (click image for full-size). Google Analytics Certified partner InfoTrust is already finding that the feature helps them measure and optimize install campaign performance. "Many of our customers have mobile apps that generate more traffic and engagement than their desktop properties. Their goals are to bring users back to the app consistently and drive more engagement through more relevant articles and products, and increasing subscriptions or purchases. Seeing which marketing campaigns drive iOS users to app installs, and what users do after the install, is critical when determining where to use marketing spend." Mobile ad networks integrated with the new reporting include Aarki, AdMob, AppLovin, Millennial Media, MdotM, Taptica and Tapjoy, with more to come soon. These iOS integrations join our existing Android campaign measurement tools. Learn more and get started easily with this step-by-step guide. We hope this iOS integration helps you make even better choices for your business and for your customers. Happy mobile analyzing! If you use AdMob or other mobile ad networks to drive installs of iOS apps, here's some good news: iOS install tracking is coming as a Public Beta in a few weeks to all Google Analytics accounts. 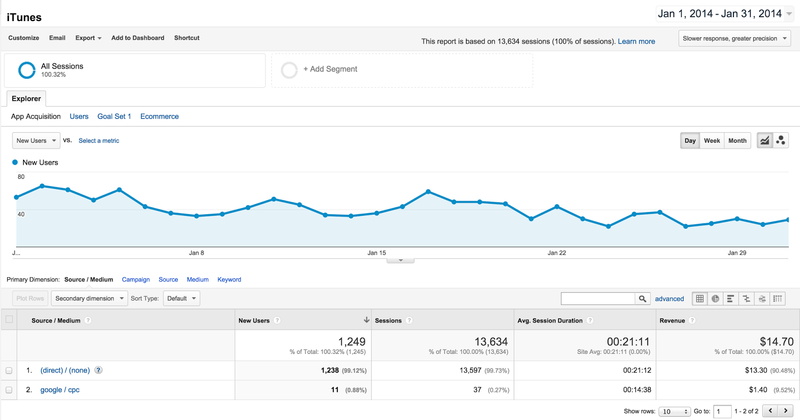 This detailed view of iOS install campaigns will be available right in your Google Analytics interface. Install metrics are a useful way to measure your marketing campaign performance. However, not all marketing efforts create the same volume and quality of users. With these new reports, you'll see how one source performs compared to another, so you can optimize your marketing spend. You can even dive deeper into the same marketing channel to see how one campaign or ad is performing compared to another. Today we’re excited to officially announce our newest Analytics Academy course, Mobile App Analytics Fundamentals, designed to help you answer these questions and more. Whether you’re an app developer or an experienced marketer in the mobile app space, knowing the fundamentals of mobile app measurement can help you improve your app marketing and monetization efforts. In this course, you’ll learn how to identify your most valuable users, how to find more of them, and how to tailor your monetization experience for different groups of users. In this free online course, instructor Fontaine Foxworth will lead you through a series of conceptual training videos and interactive exercises to teach you about Mobile App Analytics. Throughout the course, she’ll use an example online gaming app called Go Fish!, which will demonstrate common Analytics use cases and help you apply what you learn to your own mobile app. After the course opens, you’ll have four weeks to earn a certificate of completion while working alongside a worldwide community of Analytics enthusiasts. In total, the course should take between two to four hours to complete. Ready to sign up? Register now and join us when the course begins on Tuesday, November 18th. We look forward to your participation in the course! So you’ve built an app? Awesome! But how are you tracking success? Does anyone know about your app? Do you have a good monetization plan? Better measurement is the answer. It’s the key to understanding and making the most of these interconnected touchpoints, but it's not always top of mind when building marketing campaigns. Today, we’re releasing Measure What Matters Most: A Marketer’s Guide to help marketers make sense of today’s complex customer journey by laying a solid measurement foundation. Focus on the right metrics. Set yourself up for success by identifying clear metrics that you want to affect before launching a campaign. Value your best customers. Instead of measuring transactions alone, model the lifetime value you derive from your customers. Attribute value across the journey. To find out what’s working in your marketing and what’s not, identify the role of each touchpoint along the customer’s journey. Prove marketing impact. Use controlled experimentation to understand what happened only because of a given marketing spend change (and would not have happened without it). Collectively, these points show how better measurement can improve campaign effectiveness, help you get the credit you deserve for your programs and, most importantly, ensure a better return on investment for all of your marketing. Download “Measure What Matters Most: A Marketer’s Guide” to find out how. It’s no secret that it takes many marketing touchpoints to connect with a customer, find a quality lead, or make a sale. But how do you know the right message to deliver at each point in that journey? How do you ensure that your investments are working, and that you’re not wasting money and resources, or worse, alienating your customers? 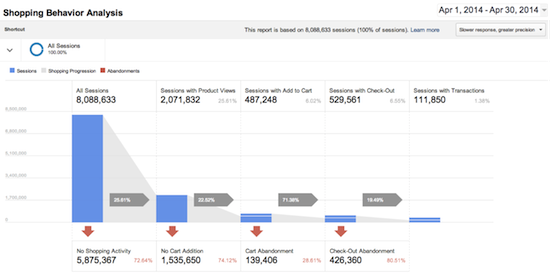 Our Enhanced Ecommerce features in Google Analytics are officially out of beta today, complete with brand new tools like Product Attribution. Combined with our new Shopping Campaigns report, Google Analytics provides our retail clients with an integrated view of their customers. As part of today’s announcements, we’re also excited to highlight partnerships with Shopify, PrestaShop, Blue Acorn for Magento, and mShopper. Using Enhanced Ecommerce in conjunction with our partners’ products simplifies the implementation process and gives you a full set of tools to create and optimize your ecommerce site. Please see the end of this post for more information about our partners’ solutions. Enhanced Ecommerce provides insight into the customer’s path to purchase, like when customers added items to cart, started the checkout process, and completed a purchase. Importantly, Enhanced Ecommerce gives you the ability to identify segments of customers who are falling out of the shopping funnel. You can then focus on these high intent-to-purchase customers with remarketing or by optimizing your checkout flow. Brian Gavin Diamonds, a Texas-based jewelry design house that is renowned for its signature hearts and arrows diamonds and custom jewelry design, used Enhanced Ecommerce to discover that in a single month they had missed out on more than half a million dollars in sales due to cart abandonment at the customer login page. The company worked quickly to optimize their checkout flow with guest checkout functionality and immediately realized a 60% increase in customers completing the checkout process to payment. You can read more about Brian Gavin Diamonds’ success with Enhanced Ecommerce in our case study. Once you’ve gotten users to your site, Enhanced Ecommerce allows you to optimize the onsite experience to drive sales. By using Product Lists, you can identify how customers are discovering and interacting with products before purchasing them. Armed with this information, you can analyze your onsite promotions in order to build a more effective merchandising strategy, or use the product attribution functionality to understand which product lists drive conversions. In an increasingly mobile world, this information is critically important since screen real estate is limited and must be used wisely. For retailers with mobile apps, the Google Analytics SDK fully supports Enhanced Ecommerce, so you can do rich analysis of product performance and customer behavior across all sales channels. Across both desktop and mobile, Enhanced Ecommerce delivers the information you need to increase sales on your site. Today, we’re also introducing a new Shopping Campaigns report as part of the AdWords reporting section in Google Analytics. This feature will be rolled out over the next few weeks and will allow you to analyze the performance of your shopping campaigns. With this functionality, you’ll have the ability to understand the product categories/types that are driving site engagement and revenue and use this information to optimize your bids. So, how can you get started? If you have already linked your Adwords and your Google Analytics accounts, this report will automatically appear in the Adwords reporting section of your Analytics account. Not linked yet? Simply follow these instructions to link the two accounts. Shopify, PrestaShop, Blue Acorn for Magento, and mShopper have partnered with us to integrate Enhanced Ecommerce as part of their ecommerce solutions. If you’re using one of these platforms, you can take advantage of Enhanced Ecommerce by enabling one of these pre-built integrations. Shopify and Blue Acorn's solutions are available today while solutions for Prestashop and mShopper will be available in the coming week. To learn more about our featured partners, please visit our partner page. 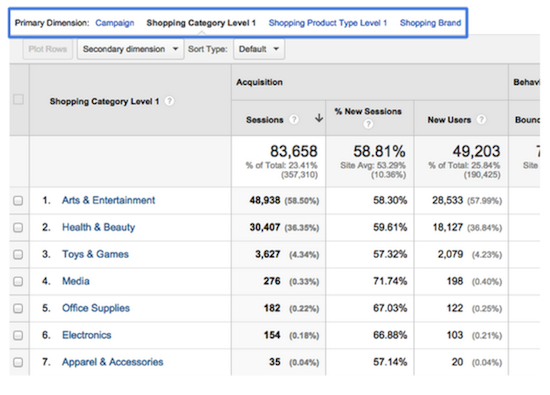 Google Analytics Enhanced Ecommerce is built to help you understand your customers and optimize your sales conversions. 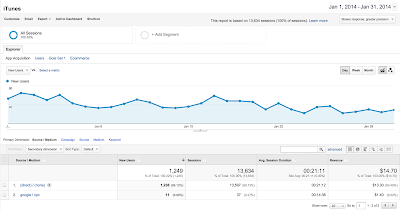 Combined with Shopping Campaign reports, Google Analytics is a complete solution for ecommerce businesses. For more information about how to implement this feature in your Google Analytics account, please see the documentation available in our help center. Shopify is a commerce platform that allows anyone to easily sell online, at their retail location, and everywhere in between. Shopify offers a professional online storefront, a payment solution to accept credit cards, a point of sale system to power retail sales and a card reader to process credit card transactions through a mobile phone. Shopify currently powers over 120,000 retailers in 150 different countries, including: Tesla Motors, Gatorade, Google, Wikipedia, LA Lakers, CrossFit, and many more. PrestaShop is a world industry leader in Open Source solutions for ecommerce, whose mission is to challenge ecommerce limits by developing a powerful solution that is accessible to anyone, anywhere. Through the Open Source software, PrestaShop allows everyone to create online stores quickly, easily and for free. The company currently counts more than 200,000 online stores worldwide, 700,000 community members and over 4 million software downloads. Blue Acorn is a premium eCommerce agency dedicated to helping retailers and brands achieve revenue growth through a comprehensive, data-driven approach. In order to best support this approach, they became the first Magento Solution Partner in the world to also hold certified partnerships with Google and Optimizely. By integrating data and testing throughout their services, they are able to help their clients make the best decisions possible and further support their best-in-class design, development, and optimization capabilities. mShopper is a leading mobile commerce platform that allows retailers to create custom, mobile-optimized e-commerce sites designed specifically to increase sales on mobile devices. The integration with Enhanced Ecommerce will provide a dramatic impact on mobile commerce conversions for retailers by delivering superior insight on product sales and overall campaign performance. mShopper recently launched mStore® v4.1 with marketing tools and a performance dashboard to drive conversions and improve sales for customers using mobile devices as well.